Do you provide HIPAA risk management solutions to covered entities and their business associates? Let us be your partner. Managed service providers (MSPs) with extensive HIPAA subject matter expertise provide a valuable service to healthcare organizations who don’t have the resources to manage their security and compliance. But even MSPs need an automated solution for compliance and risk management. Trying to manually manage thousands of vendor agreements for multiple clients? It isn’t easy, and can lead to inefficiencies and errors. ComplyAssistant’s HIPAA for MSPs solution is a powerful tool to have in your toolbox. Our healthcare compliance software helps you organize and accurately manage your clients’ security and risk programs. And, with the time efficiencies you’ll gain, you can take on more clients – and more revenue in your pocket. With our HIPAA for MSPs white-label program, you get custom development of our healthcare compliance software. We work with you to build client-specific regulation content and reports. You’ll get an enterprise license that includes unlimited user access. And, we offer ongoing training options and materials, based on your needs. Any healthcare organization can have hundreds of business associates. If you’re managing third-party risk for more than one client, that can get overwhelming pretty quickly! ComplyAssistant’s powerful filtering and search lets you manage thousands of BAs by exception. 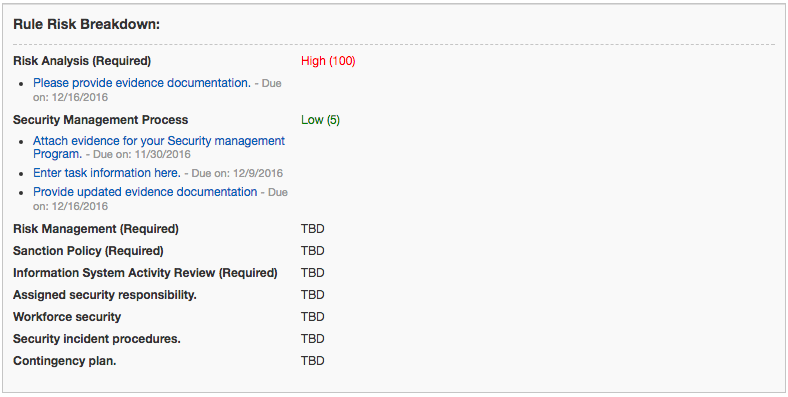 You can also easily track the progress and completion of each BA assessment. How often do you have to remind BAs to complete audit tasks? Are you manually sending hundreds of reminders via email? There’s a faster way to keep BAs accountable. ComplyAssistant’s HIPAA for MSPs solution will do this for you! We automatically remind BAs of their tasks, and we keep track of email delivery success and bounces. Our healthcare compliance software is built to aggregate and assign tasks based on the HIPAA rule. Our HIPAA for MSPs solution takes you step-by-step through the rule, allowing you to see your clients’ risk and action items to effectively manage by exception. And, while we specialize in HIPAA, we can customize the software for any regulation needed by you and your clients. In addition to third-party vendor assessments, you may also perform internal assessments for your own clients. ComplyAssistant’s HIPAA for MSPs solution enables you to manage all of your CE assessments, providing summary and trending reports that show compliance for any regulation. All of your clients’ tasks, assessments and reports are housed in our software. Easily distribute deliverables and grant access directly to any client, right from the software. Your clients have continuous, read-only access to their reports. Our HIPAA for MSPs white-label program is an essential partner to manage your clients’ security and compliance. Extend your own client base with a solution that can support compliance management for covered entities and business associates. ComplyAssistant’s HIPAA for MSPs solution can be customized to fit your clients’ needs. Kardon needed a partner we could count on to creatively solve problems. ComplyAssistant helped us customize HIPAA compliance solutions for small physician practices who don’t have the budgets and resources of large systems. Our relationship has been mutually beneficial – together we take a different approach to advise and recommend healthcare providers on improvements to their compliance processes. Arm your team with our HIPAA for MSPs solution. Looking for a better way to organize your clients’ BA information? Try our business associate inventory spreadsheet.